Today 22 July 2012 Sunday is Celebration Teej Festival of All Indian Hindus. This Festival is celebration in Boston USA, Berkely CA, UK, and any other contry. The festival of Teej encapsulates energy, happiness, vigor and happiness. Days before Teej, women shop sarees, jewellary, groom themselves for their husbands. They apply mehndi and alta. One of the most difficult fasts, the NIRJALA fast is the soul of the day. It is a pre-day fast, and so all women of a family, neighbors, and relatives gather to have a gulp of food at mid-night, as they are not supposed to take water or food the entire day. It is very popular inRajasthan, Gujarat and Punjab and compulsory for woman of kayastha community. As it is a difficult fast so women engage themselves in games, swings, songs, movies and other forms of entertainment taking a day off from regular house-hold activities. It is advised that pregnant or sick women do not take up this fast as it can affect their health, or they should supplement their diet with juices and milk. Women observe the fast, usually gather in a temple or at a common place, with mehndi on hands and beautifully dressed. They offer the Katha to Goddess Parvati in the daytime with the complete procedure, then see moon in the night, and offer prayers to it, to complete their puja and then finally take meals. The complete process with necessary ingredients is as follows. Shrinjhara (Gift Pack) : It is customary for married women to return to their parent’s home. They receive a gift pack from their in-laws called the Shinjhara derived from “Shringaar”. This pack contains all items for shringaar of their bahus. Right from Leherai sarees, Heena, Lac bangles to sweets like ghewar. Baya (Gift Pack): It is normally given to newly wed daughter-in laws by their mother-in laws. Baya is normally given to women observing fast comprising of sweets, mathris, clothes and jewellery. Swings: To engage themselves on a hard fasting day of teej, women enjoy swings, songs and other sorts of entertainment. Mehndi : It is traditionally a norm to apply mehndi on this occasion. Mehndi application is one of the important rituals in Teej . Not only married women but young girls also apply mehndi on this occasion. 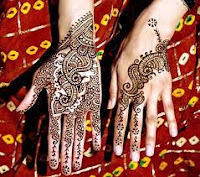 These days many kinds of mehndi are famous and preferred by different women. Beauty parlors are full and booked for this purpose. Earlier women used to apply alta to decorate their hands, but today there are many varities of mehndi that when washed can be removed , which is preferred by working women. Teej - 'the festival of swings' is celebrated with gusto and fervor in various parts of India and Nepal. The festival of Teej commemorates the reunion of Lord Shiva and Goddess Parvati. Married women and young girls celebrate the festival with earnest devotion. Teej falls in the month of Sawan and brings great relax from the scorching summers. Many religious activities takes place at the time of Teej. Such rituals and customs of Teej forces people to become part of grand Teej celebrations. Teej has many significant roles to play in one's life. Women observing Nirajara Vrat on Teej are said to be blessed with long and healthy life of their husband by Teej Mata Parvati. Various other customs and rituals of Teej make the festival more important. Teej gives a chance to women to express their love and devotion for their husband who in return present beautiful gifts to their wife as a token of love. To know in detail about Teej and its celebration, please click on the links given below and splurge in the festive mood. Akshay Tritiya falls on the third day of the Shukla Paksh in the month of Baisakh. On this day, the doors of the holy temple of Badrinath Dhaam are opened for thepilgrims. On this auspicious day only in Vrindavan, pilgrims have the good fortune of having the darshan of the charan of Shri Bihariji (Shri Krishna). This day the shringaar is done with sandalwood. This darshan can be done only on this day in the whole year. In the morning moong daal, khichdi and amlaana is prepared. Shikanji and sherbat are offered to people. On this day neither papads are roasted nor is any food item is deep fried. Seedha is given to the Brahmin. Offering shoes and fans have special significance. 'Badrinarayanaji (Shri Vishnu) ki puja' is done by offering tulsi leaves, mishri and soaked chana daal.